Pain or discomfort in the abdomen. This is the area below the rib cage and above the thighs. There are many causes of abdominal pain. Most causes are not serious. Mild stomach pain can be caused by an upset stomach, gas pains, or eating too much. 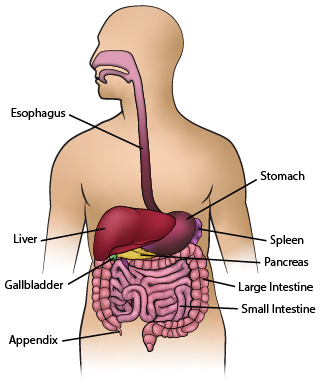 There are many organs in the abdomen that can also cause pain. In women, pain can also be caused by female organs or pregnancy. All women of childbearing age with abdominal pain should consider the chance that they are pregnant. Stomach pain is more likely to be serious in an older person. Mild stomach pain can be caused by an upset stomach, gas pains, or eating too much. Sometimes mild stomach pain is the first sign of a vomiting illness like stomach flu. You can treat mild stomach pain at home. Rest: Lie down and rest until you feel better. Fluids: Sip only clear fluids until the pain is gone for over 2 hours. Clear fluids include water, broth, and water mixed with fruit juice. Then slowly return to a normal diet. Start with clear liquids. When you feel better, you can begin eating a bland diet. Avoid alcohol or drinks that have caffeine in them. Pass a Bowel Movement (BM): Sit on the toilet and try to pass a BM. Do not strain. Having a BM can help pain caused by diarrhea or constipation. Avoid Medicines: Any drug can bother the stomach lining and make the stomach pain worse. This happens more often when you take drugs like aspirin and ibuprofen. Do not take any pain or fever medicines or other drugs for stomach cramps. What to Expect: With harmless causes, the pain most often goes away within 2 hours. With stomach flu, the pain may come and go for 2 to 3 days. You may have belly cramps before you throw up or have diarrhea. If your pain does not stop and gets worse, it may be more serious.